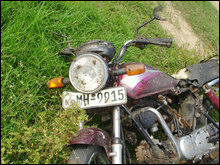 A motorcyclist escaped with wounds, but his bike was thrown 70 meters away from the road. 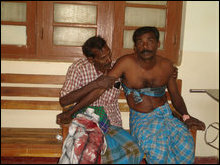 Medical Superintendent of Vanni's main hospital at Tharmapuram, Dr. S. Sathiyamoorthy, has placed the hospital and the surrounding area on red alert for blood shortage as Sri Lanka Army (SLA) launched artillery attack on the village after the carnage by the SLAF. 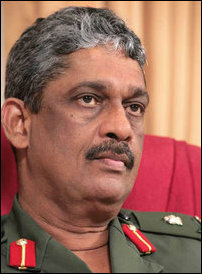 Sri Lanka Army Commander Sarath Fonseka, in an interview to Business Today on December 11, 2008, said: "We have been exemplary in adhering to the policy of Zero Damage to Civilians." 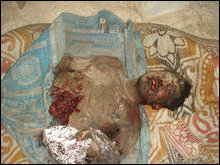 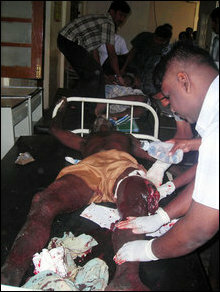 According Fonseka, there were only 24 civilians confirmed killed in the two and a half year war. 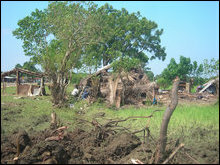 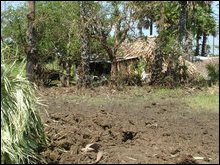 The Sri Lankan air strike targeted civilian houses behind Murugananda school, two settlements of refugees, one at Chelliah Shop Junction and the other behind Cheaththukka'ndi Amman temple at Murasumoaddai. 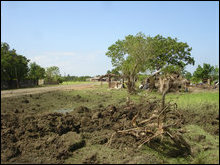 A few hours later, the SLAF fighter jets returned to the same village and dropped bombs while a cow herder, was moving away with his cows from Paranthan to his native village, Tharmapuram. 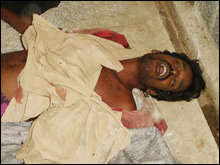 Two others were also wounded in the second bombardment. 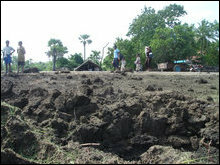 Meanwhile, a 29-year-old male, T. Sasikaran, was seriously injured when Sri Lanka Army (SLA) fired artillery shells targeting settlements in 2nd Mile Post. 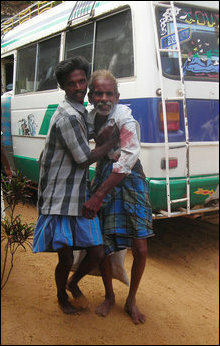 Mr. Sasikaran wounded in his head was rushed to hospital in unconscious state and is at the stage of coma, according to the latest update from the medical sources Wednesday night. 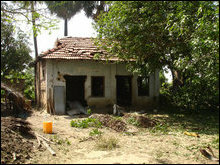 24-year-old Juda Margarat Aseervatham, 55-year-old Asservaatham Maryamma and Markandu Sivanandan were killed on the spot. 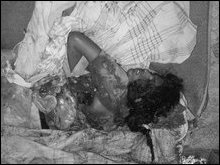 52-year-old Chandrabose and 37-year-old Kannan, two of the wounded who were admitted at Tharmapuram hospital, succumbed to their injuries at the Intensive Care Unit. 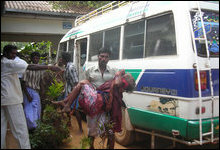 The wounded civilians in the first bombardment on three localities were identified as I. Nirmalan, 15, S. Ragulan, 21, Arumaiththurai Jesinald, 26, Ramachandran Kumanan, 30, Selvarajah Kulendran, 33, K. Jeyasri, 38, Somasundaram Chandrakumar, 43, Annakkodi Chandramary, 45, Vellaichamy Annakkodi, 49, S. Balasundaram, 51, Palaniayappan Subramaniyam, 52, Ranjithamalar, 58, and Saravana Bavananthan, 62. 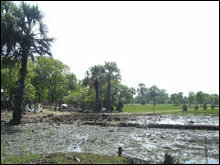 SLAF bombardment close to the Karaichchi branch office of the ICRC. 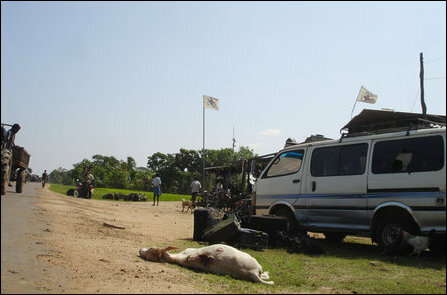 A cow killed in the air strike is lying in front of the office with ICRC flags and markings. 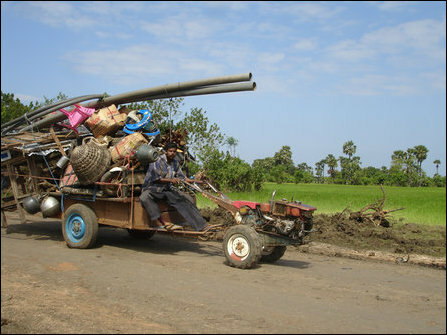 A heavily loaded land master is passing the site bombed by SLAF. 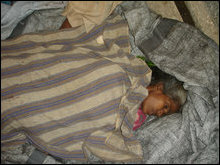 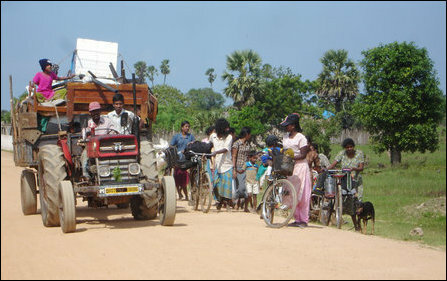 Many refugees were fleeing from SLA shelling in Paranthan area amid SLAF bombardment.